Running Brook Children's Nursery (RBCN) is a co-operative preschool. A co-operative preschool is a school established and directed by parents. Parents select and hire a qualified teaching staff, take turns working beside teachers in the classroom, and manage all the institutional needs of the program. Parent participation keeps costs relatively modest, compared to schools run on corporate systems. Co-op schools have a community feel, and families tend to form close relationships that last well beyond the pre-school years. RBCN was established in 1969. Our school is based on a collaborative effort between parents and teachers, dedicated to bringing meaningful and enriching experiences to preschool children, and building a supportive community for their families. 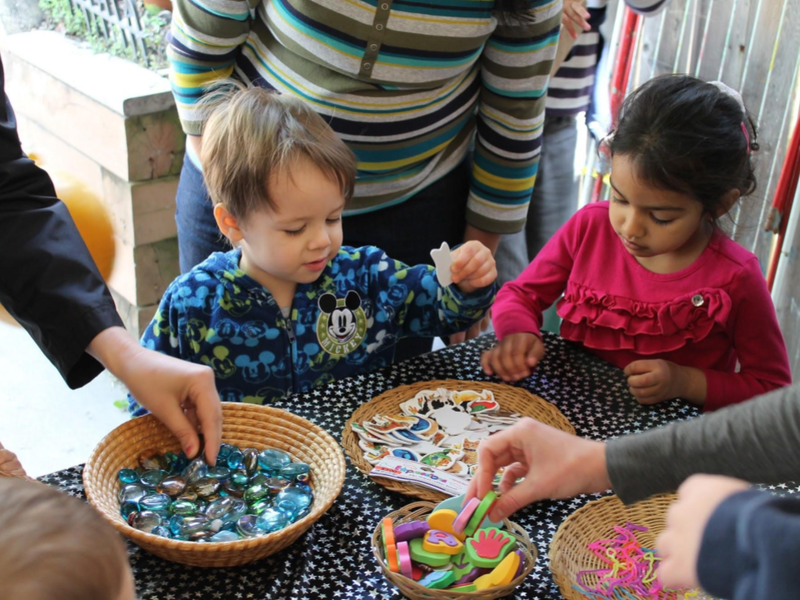 RBCN offers a preschool program for two, three, and four-year-old children. Our teachers are highly qualified and experienced. RBCN is a non-profit educational institution. We are an equal opportunity employer, and follow state and federal governmental guidelines for non-discrimination in hiring and acceptance policies. All classes currently filled for 2018-2019, however occasionally students transfer mid-year. Contact us to schedule a tour and register today! "The Program at RBCN far outshines any program I have seen or heard about. When my first child went to kindergarten, he knew things about science and social studies than no other child in his class knew, thanks to RBCN." "The curriculum meets the social needs of my child, which at this age, I understand is very important. She has learned to express her feelings beautifully this year. The teachers are both very approachable and give me insight into my child’s development. Mrs. Jo has given terrific child rearing advice outside of school on her own time, which is very admirable." "I love the way the children are always learning even when they think they are only playing." "My child loves going to school, loves the teachers and views RBCN as a safe, warm place to be, which as a parent, is very important to me." "I am amazed at how well Mrs. Jo knows my child. In her evaluations and conferences – she is right on the mark. I am sad that my child is graduating, but I know he is so well prepared for kindergarten. "Many thanks to our teachers who put tremendous time, energy, and care into making RBCN the wonderful, child-centered preschool that it is." A co-operative preschool is a school established and directed by parents. Parents select and hire a qualified teaching staff, take turns working beside teachers in the classroom, and manage all the institutional needs of the program. Parent participation keeps costs relatively modest, compared to schools run on corporate systems. Co-op schools have a community feel, and families tend to form close relationships that last well beyond the pre-school years. © 2019 Copyright Running Brook Children's Nursery.